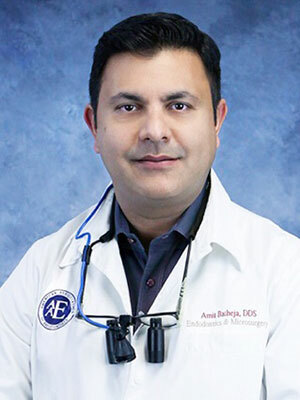 Dr. Amit Batheja is a specialist in dentistry in the field of Endodontics. He received his Doctor of Dental Surgery degree from Loma Linda University in 2002 and went on to practice general dentistry for 5 years. He also served in the Emergency Care faculty at the University of Southern California. He undertook two additional years of specialized training and completed his residency in Endodontics at the University of Southern California Herman Ostrow School of Dentistry in 2009. His research during his residency focused on microsurgical cases specifically involving recalcitrant lesions and non-healing cases which included detection and isolation of cholesterol crystals from within cystic lesions. As an endodontist, Dr. Batheja has high personal standards, and focuses on patient education and understanding of the need for treatment and its various alternative options. Dr Batheja takes his time to include a thorough diagnosis and identification of the patient concerns as they relate to their overall comfort, well-being and peace of mind. Dr Batheja’s appreciation of the preventive aspects especially in pediatric cases, and highly competent interceptive clinical skills provide his patients with a very high standard of endodontic care. He performs routine and complex endodontic treatment with the most conservative management whenever possible as well as in treatment of advanced cases requiring endodontic retreatment or surgery. He takes the philosophy ‘to make man whole’ from his alma mater Loma Linda University much to heart and values his learning from late Dr James Simon at USC and enjoys partnering with organizations which benefit children. Dr. Batheja is an active member of the American Dental Association, California Dental Association, Tricounty Dental Society, and the American Association of Endodontists. He enjoys hiking, traveling, and reading, and takes a keen interest in studying the work of Dr. David R. Hawkins.